Victoria is the capital city of British Columbia, the westernmost province of Canada. Located on the southern tip of Vancouver Island, Victoria is a global tourism destination seeing millions of visitors a year who inject over a billion dollars into the local economy. The city also receives economic benefits from its close proximity to Canadian Forces Base Esquimalt, the Canadian military’s main Pacific naval base. Victoria is known for its natural beauty, British heritage and architecture, and temperate climate. It is Canada's most popular domestic retirement destination. With its mild temperatures and plentiful sunshine, Victoria's gardens are homes to many plant species rarely found elsewhere in Canada, which have added to its reputation as the "City of Gardens." Located on the southeastern tip of Vancouver Island, overlooking the Strait of Juan de Fuca, the City of Victoria has a population of approximately 78,659. 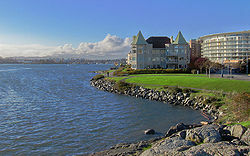 Greater Victoria, has a population of more than 345,000 and is the largest urban area on Vancouver Island. By population, Greater Victoria is the fifteenth largest city metropolitan area in Canada. Victoria is well-known for its disproportionately large retiree population. Retirees throughout Canada are drawn to Victoria's mild climate, beautiful scenery, year-round golf season, and generally easy-going pace of life. An historically popular cliche about Victoria is that it is for "the newly wed and nearly dead!" The city's chief industries are tourism, education, federal and provincial government administration and services. Other nearby employers include the Canadian Forces (the Township of Esquimalt is the home of the Pacific headquarters of the Canadian Forces Maritime Command), and the University of Victoria (located in the municipalities of Oak Bay and Saanich). Other sectors of the Greater Victoria area economy include: investment and banking, online book publishing, various public and private schools, foodstuff manufacturing, light aircraft manufacturing (Viking Air), technology products, various high tech firms in pharmaceuticals and computers, engineering, architecture and telecommunications. A large call centre is also located in the region, along with call centres of other corporations. Vancouver Island Advanced Technology Center is an umbrella organization, partnership between industry and education, promoting high tech industry development in the Victoria region. In recent years, high technology has over taken tourism as the top performing economic sector in Greater Victoria. Prior to the arrival of the Europeans in the late 1700s, the Victoria area was home to several communities of native Coast Salish peoples, including the Songhees. The Spanish and British took up the exploration of the northwest coast of North America beginning with the voyage of Captain James Cook in 1776, although the Victoria area of the Strait of Juan de Fuca was not penetrated until 1791. Spanish sailors visited Esquimalt Harbour in 1790 and again in 1792. Erected in 1843 as a Hudson's Bay Company trading post on a site originally called Camosun (the native work was "camosack," meaning "rush of water") and known briefly as "Fort Albert," the settlement was later christened Fort Victoria, in honour of the Queen. The Songhees established a village across the harbor from the fort. The Songhees' village was later moved north of Esquimalt. When the crown Colony of Vancouver Island was established in 1849, a town was laid out on the site and made the capital of the colony. The Chief Factor of the fort, James Douglas was made the second governor of the Vancouver Island colony (Richard Blanshard was first governor, Arthur Edward Kennedy was third and last governor), and would be the leading figure in the early development of the city until his retirement in 1864. 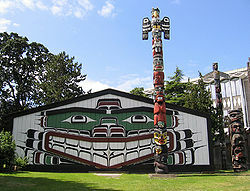 Wawadit'la, also known as Mungo Martin House, a Kwakwaka'wakw "big house," with heraldic pole. Built by Chief Mungo Martin in 1953. Located at Thunderbird Park in Victoria, British Columbia. With the discovery of gold on the British Columbia mainland in 1858, Victoria became the port, supply base, and outfitting centre for miners on their way to the Fraser Canyon gold fields, mushrooming from a population of 300 to over 5,000 literally within a few days. Victoria was incorporated as a city in 1862. In 1865, Esquimalt was made the North Pacific home of the Royal Navy, and remains Canada's west coast naval base. 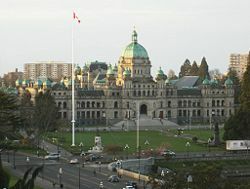 In 1866, when the island was politically united with the mainland, Victoria remained the capital of the new united colony and became the provincial capital of British Columbia when it joined the Canadian Confederation in 1871. In 1886, with the completion of the Canadian Pacific Railway terminus on Burrard Inlet, Victoria's position as the commercial centre of British Columbia was irrevocably lost to the City of Vancouver. The city subsequently began cultivating an image of genteel civility within its natural setting, an image aided by the impressions of visitors such as Rudyard Kipling, the opening of the popular Butchart Gardens in 1904 and the construction of the Empress Hotel by the Canadian Pacific Railway in 1908. Robert Dunsmuir, a leading industrialist whose interests included coal mines and a railway on Vancouver Island, constructed Craigdarroch Castle in the Rockland area, near the official residence of the province's lieutenant-governor. His son James Dunsmuir became premier and subsequently lieutenant-governor of the province and built his own grand residence at Hatley Park (used for several decades as a military college, now Royal Roads University) in the present City of Colwood. A real estate and development boom ended just before World War I, leaving Victoria with a large stock of Edwardian public, commercial and residential structures that have greatly contributed to the City's character. A number of municipalities surrounding Victoria were incorporated during this period, including the Township of Esquimalt, the District of Oak Bay, and several municipalities on the Saanich Peninsula. Since World War II the Victoria area has seen relatively steady growth, becoming home to two major universities. Since the 1980s the western suburbs have been incorporated as new municipalities, such as Colwood and Langford. The thirteen municipal governments within the Capital Regional District afford the residents a great deal of local autonomy, although there are periodic calls for amalgamation. Victoria has a temperate climate that is usually classified as Marine west coast (Cfb), with mild, damp winters and relatively dry and mild summers. It is sometimes classified as a Mediterranean climate (Csb). Daily temperatures rise above 30°C (86°[Fahrenheit|F]]) on an average of one or two days per year and fall below -5°C (23°F) on an average of only 2 nights per year. During the winter, the average daily high and low temperatures are 8.2°C (47°F) and 3.6°C (38°F), respectively. The summer months are equally mild, with an average high temperature of 19.6°C (67°F) and low of 11.3°C (52°F). Victoria does occasionally experience more extreme temperatures. The highest temperature ever recorded in Victoria was 35.3°C (96°F) on July 23, 2004, while the coldest temperature on record was -15.6°C (4°F) on December 29, 1968 and January 28, 1950. Victoria has not recorded a temperature below -10°C (14°F) since 1990. Total annual precipitation is just 608 mm (24 in) in Victoria, contrasted to nearby Seattle, (137 km/85 miles away to the southeast), with 970mm (38in) of rainfall, or Vancouver, 100 km away, with 1,219 mm (48 in) of rainfall. Perhaps even more dramatic is the difference in rainfalls on Vancouver Island. 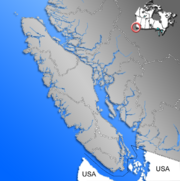 Port Renfrew, just 80 km from Victoria on the wet southwest coast of Vancouver Island receives 3,671 mm (145 in). Even the Victoria Airport, 25 km north of the city, receives about 45 percent more precipitation than the city proper. One of the most striking features of Victoria's climate is the distinct dry and rainy seasons. Nearly two thirds of the annual precipitation falls during the four wettest months, November to February. Precipitation in December, the wettest month (109 mm/4 in) is nearly eight times as high as in July, the driest month (14 mm/.5 in). During the summer months, Victoria is the driest major city in Canada. Victoria averages just 26 cm (10 in) of snow annually. Every few decades, Victoria receives very large snowfalls, including the more than 100 cm (39 in) of snow that fell in December 1996. On the other hand, roughly one third of winters will see virtually no snow, with less than 5 cm (2 in) falling during the entire season. When snow does fall, it rarely lasts long on the ground. Victoria averages just two-three days per year with at least 5 cm (2 in) of snow on the ground. The rain shadow effect also means that Victoria gets more sunshine than surrounding areas. With 2,223 hours of sun annually, Victoria is one of the sunniest places in British Columbia, and gets more sunshine than most other cities in Canada except those in the southern Prairies. Victoria's equable climate has also added to its reputation as the "City of Gardens." With its mild temperatures and plentiful sunshine, Victoria boasts gardens that are home to many plant species rarely found elsewhere in Canada. Several species of palms, eucalyptus, and even certain varieties of bananas can be seen growing throughout the area's gardens. The city takes pride in the many flowers that bloom during the winter and early spring, including crocuses, daffodils, early-blooming rhododendrons, cherry and plum trees. Every February there is an annual "flower count" in what for the rest of the country and most of the province is still the dead of winter. Due to its Mediterranean-type climate, Victoria and its surrounding area (southeastern Vancouver Island, Gulf Islands, and parts of the Lower Mainland and Sunshine Coast) is also home to many rare, native plants found nowhere else in Canada, including Quercus garryana (Garry oak), Arctostaphylos columbiana (Hairy manzanita), and Canada's only broadleaf evergreen tree, Arbutus menziesii (Pacific madrone). Many of these endangered species exist here at the northern end of their range, and are found as far south as Central and Southern California, and even parts of Mexico. The landscape of Victoria was molded by water in various forms. Pleistocene glaciation put the area under a thick ice cover, the weight of which depressed the land below present sea level. These glaciers also deposited stony sandy loam till. As they retreated, their meltwater left thick deposits of sand and gravel. Marine clay settled on what would later become dry land. Post-glacial rebound exposed the present-day terrain to air, raising beach and mud deposits well above sea level. The resulting soils are highly variable in texture, and abrupt textural changes are common. In general, clays are most likely to be encountered in the northern part of town and in depressions. The southern part has coarse-textured subsoils and loamy topsoils. Sandy loams and loamy sands are common in the eastern part adjoining Oak Bay. Victoria's soils are relatively unleached and less acidic than soils elsewhere on the British Columbia coast. Their thick dark topsoils denoted a high level of fertility which made them valuable for farming until urbanization took over. In the heart of downtown are the British Columbia Parliament Buildings, The Empress Hotel, the gothic Christ Church Cathedral, and the Royal British Columbia Museum, with large exhibits on local Aboriginal peoples, Natural History, Modern History, along with traveling international exhibits. In addition, the heart of downtown also has the Emily Carr House, Royal London Wax Museum, Victoria Bug Zoo, and the Pacific Undersea Gardens, which showcases marine life of British Columbia. The oldest (and most intact) Chinatown in Canada is located within downtown. The Art Gallery of Greater Victoria is located close to downtown. CFB Esquimalt navy base has a base museum dedicated to naval and military history, located in the Naden part of the base. North of the city on the Saanich Peninsula are the Butchart Gardens, one of the biggest tourist attractions on the island, as well as the Dominion Astrophysical Observatory, part of the National Research Council of Canada, Victoria Butterfly Gardens and Centre of the Universe planetarium. There are also numerous National Historic Sites in close proximity to Victoria, such as the Fisgard Lighthouse, Craigflower Manor and Schoolhouse, Hatley Castle and Hatley Park and Fort Rodd Hill, which is a coastal artillery fort built in the late 1890s, located west of the city in Colwood. Also located west of the city is Western Speedway, a four-tenths-mile oval vehicular race track and the largest in Western Canada. The Victoria International Airport has non-stop flights to and from Toronto, Honolulu, Salt Lake City, Seattle and many cities throughout Western Canada. Multiple scheduled helicopter and seaplane flights are available daily between Victoria harbor and Vancouver. The BC Ferries Swartz Bay Ferry Terminal, located 29 kilometers north of Victoria, has bi-hourly sailings to Tsawwassen (a ferry terminal south of Vancouver) and to many of the Gulf Islands. The Washington State Ferry terminal in Sidney provides ferry service to Friday Harbor, Orcas Island, and ultimately Anacortes, Washington. In Victoria's Inner Harbour, an international ferry terminal provides car ferry service to Port Angeles, Washington, high-speed catamaran service to downtown Seattle, and seasonal passenger ferries to destinations in Washington including Friday Harbor, Port Angeles, and Bellingham. Victoria also serves as the western terminus (Mile Zero) for Canada's Trans-Canada Highway, the longest national highway in the world. 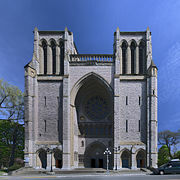 The Victoria area has three post secondary educational institutions: University of Victoria (UVic), Camosun College, Royal Roads University. In addition, there is one international school, in Metchosin Municipality, devoted to the ideals of a united world of peaceful cooperation and coexistence, Lester B. Pearson College of the Pacific. Pearson College is named after former Canadian Prime Minister Lester B. Pearson, a winner of the Nobel Peace Prize and architect of the United Nations Peace Keeping program. ↑ City of Victoria - History Retrieved June 15, 2012. ↑ 2006 Community Profiles. Statistics Canada. Retrieved June 15, 2012. ↑ Census Profile - Census Subdivision. 2.statcan.ca (2012-02-01). Retrieved June 15, 2012. ↑ BC Municipal Population Estimates, 1996-2006. BC Stats. Province of British Columbia. Retrieved April 14, 2008. ↑ 2006 Census Results, Capital Region (PDF). Capital Regional District. Retrieved April 14, 2008. ↑ Population Counts, Land Area, Population Density and Population Rank, for Canada, Provinces and Territories, and Census Subdivisions (Municipalities), 2006 Census - 100% Data, Statistics Canada. Retrieved April 14, 2008. ↑ City of Victoria - History, City of Victoria. Retrieved April 14, 2008. ↑ Thunderbird Park – A Place of Cultural Sharing. Royal British Columbia Museum. Retrieved April 14, 2008. House built by Mungo Martin and David Martin with carpenter Robert J. Wallace. Based on Chief Nakap'ankam's house in Tsaxis (Fort Rupert). The house "bears on its house-posts the hereditary crests of Martin's family." It continues to be used for ceremonies with the permission of Chief Oast'akalagalis 'Walas 'Namugwis (Peter Knox, Martin's grandson) and Mable Knox. Pole carved by Mungo Martin, David Martin and Mildred Hunt. "Rather than display his own crests on the pole, which was customary, Martin chose to include crests representing the A'wa'etlala, Kwagu'l, 'Nak'waxda'xw and 'Namgis Nations. In this way, the pole represents and honours all the Kwakwaka'wakw people." ↑ World Climates after Köppen-Geiger. Retrieved April 14, 2008. ↑ Kottek, M. and J. Grieser, C. Beck, B. Rudolf, and F. Rubel. World Map of the Köppen-Geiger climate classification updated. Meteorol. Z. 15: 259-263. ↑ Canadian Climate Normals 1971-2000 Retrieved April 14, 2008. ↑ Cricket in Canada/Daily Colonist, March 16, 1863, University of Victoria. Retrieved April 14, 2008. ↑ BRC-HIA: Centre of the Universe - Public Observatory and Astronomy Centre, National Resource Canada, 2008. Retrieved April 14, 2008. Plasterer, Herbert. Fort Victoria: From fur trading post to capital city of British Columbia, Canada. 1967. History of "Victoria, British Columbia"
This page was last modified on 25 October 2016, at 20:53.